The MidwayUSA Foundation was established to fund youth shooting teams and ensure those funds allow youth shooting sports teams to be around forever. The functions of the Foundation are critical for supporting each of our organizations that hold an earmarked endowment with us. 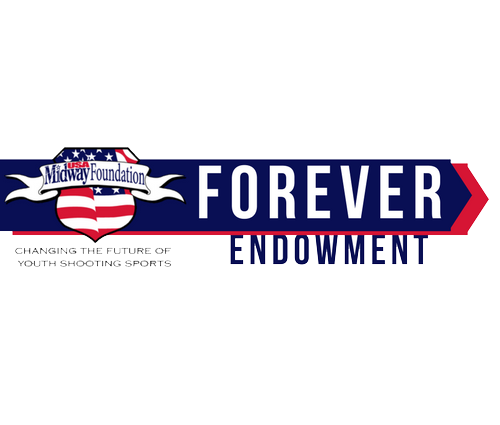 For that reason, we too have an endowment to ensure our future…the MidwayUSA Foundation FOREVER Endowment. Since our establishment, Larry and Brenda Potterfield have donated every dollar for our operations. Their contributions cover our software, computers, staff salaries, paper, desks, office space, fundraising products, grant and donation processing and more. There is no question of their commitment to youth shooting sports and that is why they have already helped us grow our Forever Endowment to $3.4 million as of February 2018. Like any visionary organization, we need to have a plan for the time when Larry and Brenda no longer contribute our Foundation’s operating budget. Our Board of Directors, Foundation staff and our Chief Investment Officer, Goldman Sachs, have put a plan in place to help us reach $30 million in our Forever Endowment over the next five years. To reach this overall funding goal of $30 million, we’ll use a combination of three funding sources. Like your team, in our future, our Board would request a 5% cash grant each year to cover our Foundation operation expenses. Five percent of $30 million is $1.5 million, which is our 2018 operating budget, not to include fundraising products. By growing the MidwayUSA Foundation Forever Endowment, we are taking one more step in ensuring your youth shooting sports team is funded FOREVER. How was this strategy developed? From June of 2017 to February 2018, our Board of Directors, Foundation staff, and our Chief Investment Officer, Goldman Sachs, worked to develop a strategy that would help us reach our goal using our current strengths, Potterfield generosity and investment power, as well as using the cumulative totals of all of our endowments to add an additional funding source. It was important that final plan to grow our Foundation Forever Endowment have a minimal impact on the endowments we hold for thousands of shooting programs. We are confident the Board of Directors plan accomplishes that. When will this contribution from endowments begin? The motion passed by the Board of Directors on February 12, 2018. The first allocation took place the first week of April, after the conclusion of the first quarter. The reallocation will occur the first week after a calendar quarter closes. Will the 1% contribution take place at once? No. To ensure minimal impact on all of our funded endowments, the Foundation will reallocate 0.25% of an endowments balance each quarter, which will total 1% for the year. Does the 1% annual contribution end after 5 years or when you reach $30 million? While we project in early 2018 that it will take 5 years to reach $30 million, the annual contribution from all endowment accounts will end when the Foundation Forever Endowment reaches $30 million, regardless of the time it takes to get there. However, the MidwayUSA Foundation Board of Directors has the authority to change or extend the contribution at anytime. Is the quarterly contribution coming out of our endowment balance, or out of our quarterly earnings? The quarterly contribution is calculated on your endowment balance as of the last day of the quarter. It will show as an expense/deduction on your account. The MidwayUSA Foundation values transparency and will not hide the contribution. Each contribution will be shown on an endowment statement that may be requested from the Foundation. How does the Foundation Forever Endowment help our shooting program? It will provide the minimal operational annual funding for the MidwayUSA Foundation when Larry and Brenda Potterfield are no longer funding 100% of Foundation operations. In support of your endowments, Foundation staff and our services will be here FOREVER to manage investments, process grants, manage donations, provide a website, and continue our mission to help communities and organizations raise funds to support their high school, college, and other youth shooting teams and activities. Review the Forever Endowment Policy.